Open 9 a.m. to 5 p.m. weekdays. Closed weekends and holidays. Closed Memorial Day. Sentient Chamber is a new interactive installation exploring a revolutionary new kind of building, raising fundamental questions about how architecture might behave in the future. Might future buildings begin to know and care about us? Might they start, in very primitive ways, to become alive? This experimental new work draws together multiple disciplines that include next-generation lightweight structures, interactive distributed computation, and synthetic biology in pursuit of a kind of architecture that comes close to being literally alive. The installation is composed of towering transparent acrylic arches and flexible silicon, creating quilt-like patterns and the sculpture’s composite structure. Custom glasswork vessels and translucent filtering elements expand the skeleton to form hovering surfaces that interplay with shadow and light. Distributed sensors throughout the chamber are programmed with algorithms that mimic curiosity, giving Sentient Chamber the power to sense and perceive, reacting to the presence of visitors with delicate waves of light and soft murmuring sounds. Sentient Chamber was created by a multidisciplinary group of architects, engineers, scientists, and artists from Canada, the U.S., and Europe working within the Living Architecture Systems Group. Professor Philip Beesley from the University of Waterloo, Canada leads the group. Installations from their ongoing “Hylozoic Series” have been shown globally to millions of visitors. Their design methods are being used to train new generations of architects and engineers, providing them with skills to work with complex and interconnected sustainable environments. 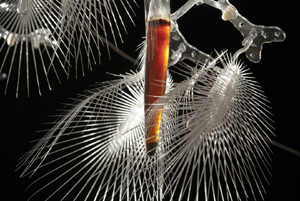 More information on projects by the group can be found at www.philipbeesley.com. This exhibition is organized by Cultural Programs of the National Academy of Sciences (CPNAS) and The National Academies Keck Futures Initiative (NAKFI) with generous support from Ralph J. and Carol M. Cicerone. Students from The Catholic University of America School of Architecture and Planning, Gallaudet University Department of Art, Communication, and Theatre, Johns Hopkins University Masters of Arts in Museum Studies, and Virginia Tech School of Architecture + Design provided installation assistance.